Home » Bike Reviews, News & More » A Revival more italian than ever! A Revival more italian than ever! The 200 Miglia di Imola Revival confirms its position as most exciting event on the Racetrack Enzo and Dino Ferrari calendar. The third edition of this event, organised by DG Sport, met all expectation of motorcycle history fanatics with a more than complete programme. Emotions, competition, great champions and the Ducati passion, everything was there. 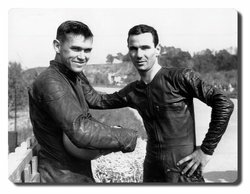 The collaboration between the 200 Miglia di Imola Revival and the racing team of Borgo Panigale created a very special atmosphere, forty years after Paul Smart’s victory aboard a Ducati two-cylinder. Sensations, thanks to the endurance race, the « 4 Hours of Imola Classic », a new feature on the 2012 programme. Not less than 43 teams appeared on the start grid. The tribunes were filled with spectators that stayed on until dawn just to see the black and white chequered flag fall on the race: Sweatshop Phase One in front, followed by Motobel’ and Taurus. There was merely time to grasp some air or a new wave of emotions followed: the champions and motorcycles from the past returned on track for the GP parade and the 200 Miglia parade. Luca Cadalora, Paul Smart, Alex Gramigni, Marcellino Lucchi, Jean Francois Baldè, Gianfranco Bonera, Fausto Ricci, Roland Freymond and Attilio Riondato were just a few of the protagonists of this tribute to a nobel past. Loris Capirossi, guest of honour of the event, put on his helmet, gloves and boots to get on track aboard a Ducati Moto GP. At his side Luca Cadalora aboard the Yamaha YZR-M1 of Jorge Lorenzo, that came to Italy thanks to the traditional collaboration with Yamaha Italy. The Ducati parade allowed the owners of the beautiful Italian machines to experience the 200 Miglia di Imola Revival in a very special and close way. And let’s not forget the more than 250 cars that participated at the GP Nuvolari and the “Price for Passion” ceremony in front of an ecstatic crowd. Reasonably satisfied yet still ambitious, the organizer, the Belgian Christian Jupsin said: « Imola has it all to turn the 200 Miglia Revival into one of the most important events in Europe. A collective effort is necessary for the next edition, which will take place in April 2013 ». The mayor of Imola, Daniele Manca and the president of Formula Imola Uberto Selvatico Estense confided us the following: « Motorcycles are at the very basis of our track and the 200 Miglia di Imola Revival can make this relive, thanks to the fantastic, colourful, natural and passionate atmosphere ». Thinking of Francesco Maria Costa, best known as Checco Costa, who was at the basis of the first 200 Miglia, the Costa family is very emotional: Thank you DG Sport, Imola, the responisbles from the track and all of you who still believe in the immortality of this dream. 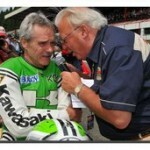 Phil Read and Kork Ballington present at the 200 Miglia di Imola Revival!